FMB fabricates and installs the complete scope of architectural and miscellaneous metal work including: metal roofing, fascia, coping, flashing, panel, expansion joint and curtain wall systems. FMB is a pioneer in the architectural sheet metal industry installing ASM systems for over 40 years. 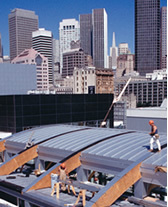 Our work is a visible part of a wide variety of major projects in the Bay Area including the San Francisco International Airport, San Francisco Main Library, Yerba Buena Center, Museum of Modern Art, Academy of Science and buildings for Laguna Honda Hospital, Mills Peninsula Hospital, San Jose Convention Center, Pixar, Yahoo, Adobe, and Altera among others. FMB is the rare firm in the Bay Area concentrating exclusively on the architectural sheet metal market. Our list of projects speaks to FMB's reputation of helping architects and owners realize their design with the quality they desire and the cost they expect.